Utagawa Kuniyoshi (1797-1861) Women in Benkei-Checked Fabrics (Shuzoroi onna Benkei): Whetstone Suggesting the Tonsure, 1844. Oban. 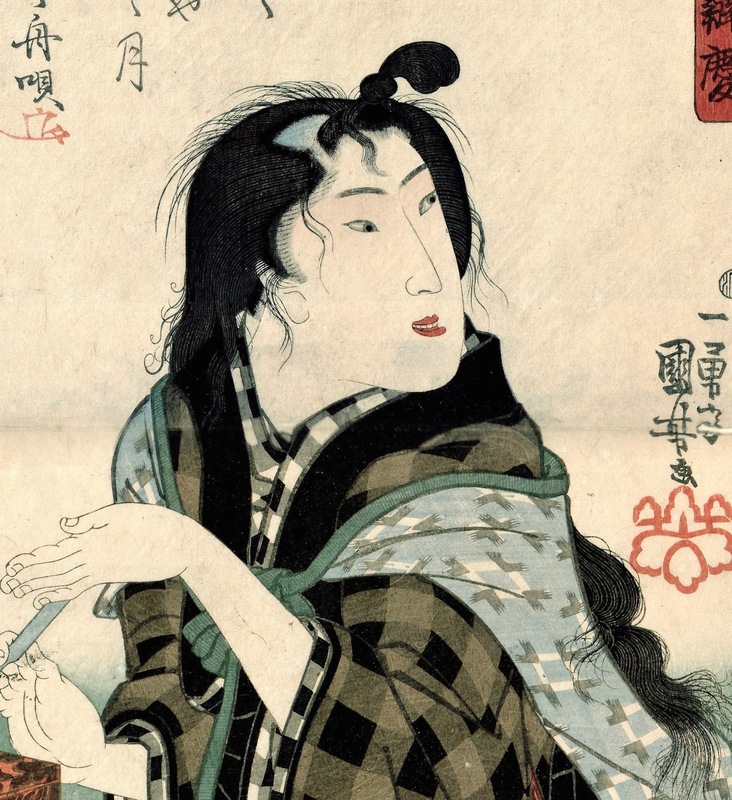 This is a very striking portrayal of a woman from Kuniyoshi of 1844. Lots going on here, principally due to the moral reforms of the Shogunate that began a few years earlier in the 1840’s. These restricted the depiction of many historical characters and scenes including theatrical roles depicting scenes from the near or ancient past… all of these subjects were the stock in trade of Kuniyoshi, and the further restrictions on likenesses of well known prostitutes, and actors made life very difficult for the woodblock artists of the newly urban scene. Looking for new subject matter became a challenge; many turned to the relatively novel genre of travel and reportage, landscapes and scenes of daily life. Kuniyoshi developed the idea of the mitate… pictures ‘standing in’ for other things, as in the case of this series. The historical character Benkei, was immensely popular among Edo townspeople; he was a Hagrid style popular hero, large, strong, magical and rough around the edges. He was also the servant and retainer of Yoshitsune and between them they led an armed rebellion against the Taira, establishing Yoshitsune’s brother as the first national Shogun - a position that would last 650 years until the19th century. Yoshitsune was betrayed by his brother and later killed himself and his family at the siege of Koromogawa no tate. 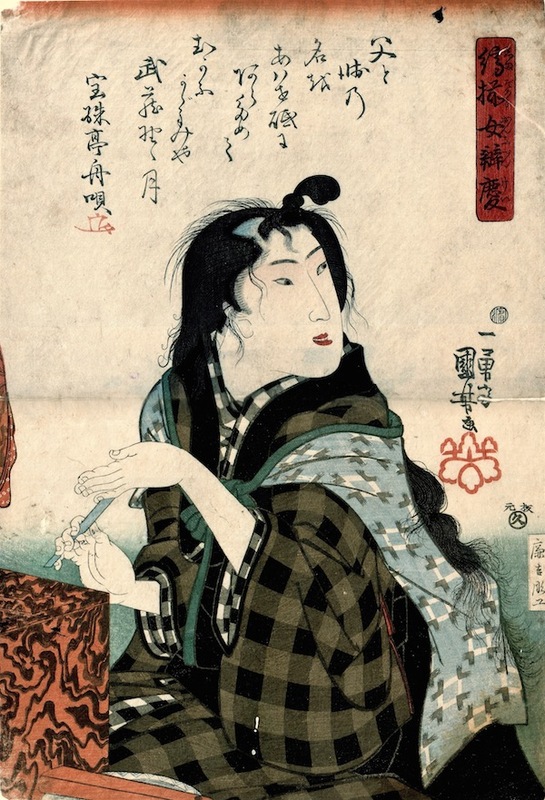 Benkei was often depicted wearing a distinctive check fabric and this series of ten prints shows different women alluding to the scenes in his life whilst wearing a similar fabric. Each print also has a kyoka poem that refers to one of the legendary incidents in Benkei’s life. This print shows a dishevelled woman shaving part of her hair into a tonsure and top knot… mimicking the style of a warrior monk and recalling that scene from the life of the legendary hero. The depiction of the woman is fascinating… she is a real rather than idealised character, her hair falls naturally, her shoulders are rounded and her clothes creased. She is looking, as if caught in a snapshot, at something or more likely someone, not in view. As noted so many times here, this picture beautifully predicts the relaxed naturalism that was to become European modernism and realism, espoused by Emile Zola and framed by Edouard Manet, by Degas and Lautrec. A fine print from a collectable and highly regarded series. Colour and impression are very fine, there is a centre fold reinforced from the reverse and visible from the front. Overall the condition is good, some surface wear and some printers' marks. The print is full sized but without margins. A copy of this print is in the Museum of Fine Arts Boston.